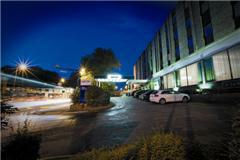 The Park Inn Nottingham is one of the largest hotels in Nottingham! * 172 bedrooms include individual climate control, walk-in showers, 26" flat-screen TVs and a contemporary décor. * All inclusive rates, making your budget easier to manage. * Fully equipped gym, sauna, steam, spa, beauty and an indoor heated swimming pool. * Just under a mile from Nottingham city centre, with easy access to all attractions, the hotel is close to the M1 motorway network and only 16 miles from Nottingham East Midlands Airport. The hotel offers car parking for over 350 vehicles. To search for a conference room or meeting room availability at Park Inn Nottingham please enter the details below. The results page will show you which meeting or conference rooms are available at this venue over the next three months for your short lead meeting, conference, or event. All hotels and each conference centre are encouraged to keep their availability updated to ensure every search for a conference or meeting room provides accurate results. Copyright © 2007-2019 all rights reserved. Web site design and hosting by Victor Consulting Ltd.